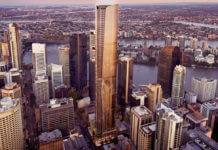 A development application has been submitted by Crown Group to build a new 12-storey residential development along the banks of the Brisbane River at 117 Victoria Street, West End. Inspired by the Brisbane River and the Hinterlands beyond, architecture firm FJMT have applied a gentle, fluid interpretation to the design with distinctive warm, golden curves which meander through the building’s facade. A subtropical river-garden design concept has also been adopted for the development which reflect’s the Brisbane City Council’s Buildings that Breathe Guidelines. This is a concept perfectly aligned to the unique subtropical climate of riverfront Brisbane. It is an architecture of deep shade, screens, fresh air ventilation, landscape and water, mediating the heat and humidity to create a beautiful natural microclimate. – FJMT Studio (Development application document). 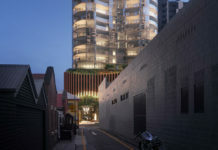 A courtyard U-shape design has been adopted by the architects for 117 Victoria Street. The U-shape is an architectural style prevalent in some cities like Chicago and has the advantage of maximising light and communal courtyard space and comes in all shapes and sizes. 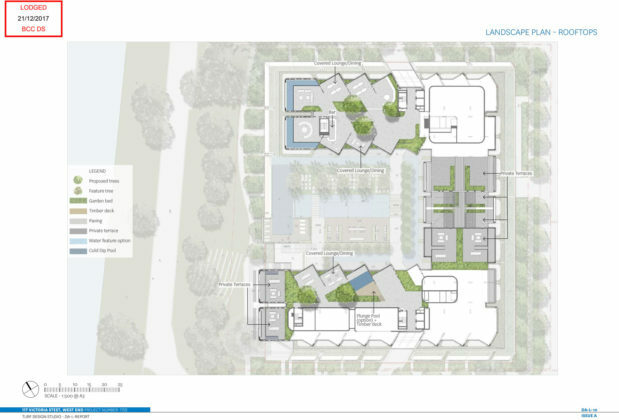 The development includes a large 1,801 sqm resident’s recreation space in the form of a central courtyard garden. Suspended at the edge of the river is a resort style infinity waterfront pool over a shared garden terrace. A BBQ area, large dining table and pool deck sun lounges are also planned for central recreation space. Stair access has been incorporated into the river edge of the podium to encourage people to spill out into the public domain and the river frontage. According to the development application, this also activates the podium as a thoroughfare space. Rooftop amenity is also planned which would include lounge and dining areas, a bar, private terraces, optional plunge pool and landscaping. This will be a unique riverfront garden lifestyle offering. Homes rather than apartments, with generous private gardens, terrace, and extensive communal landscaped environments. The form and image of the architecture is organic and riverside inspired. Tall and slender forms rise and turn towards the view like a natural river landscape: river lagoons, pools, River Gums, reeds, and exotic flowering plant life. – FJMT Studio (Development application document). Unusually large internal apartment areas. as Food and Drink Outlet or Shop. According to the development application, the retail space will provide activation and casual surveillance to Victoria Street and Riverside Lands Park and includes areas for outdoor dining. amenity of the pedestrian environment. The development application number for this project is A004827228. Looks great but the amount of retail area on ground plane seems ridiculously small for this location. Montague Road between Victoria and Vulture Streets is regularly gridlocked and nearly impossible for pedestrians to cross during peak hour and when the markets are on, something Brisbane City Council seems unable to meaningfully address. They keep approving these high density developments though. I hope this one is so damn great the residents never want to leave, because that may be a struggle.